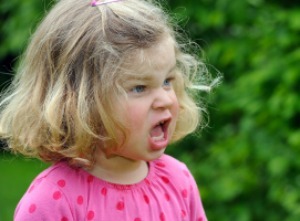 Have you ever tried to reason with your child when they are having a tantrum? Or have you ever wondered why on earth they are making such a massive fuss over something seemingly so unimportant? The reason is not that your child is wilfully ignoring you, or manipulating you or making a fuss over nothing. The reason is to do with the brain and how it works. So to really understand what’s going on, here’s a really basic guide to the brain. This is the oldest sub brain which is essentially the mechanical part, controlling automatic functions such as breathing, swallowing, our heart beating, etc. communicate with each other – mothers instinctively sing to babies and babies instinctively cry out for their mothers. Crying is different to language as you will see. It has both communicative and stress releasing functions. Our limbic system is like our very own radar system – it’s constantly assessing what’s happening and searching for connection with other people in order to help us feel safe & secure. When the limbic system feels connected and calm, it relaxes and allows the other parts of the brain to function fully. Neuroscience researchers have found that the neocortex is regulated by the other parts of the brain. ie. 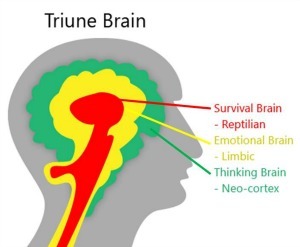 if the reptilian or limbic brains do not feel happy, connected or calm, then our neocortex can’t function properly. So how does this apply to tantrums? When your child is frustrated, angry, upset, afraid, etc, these emotions become overwhelming and the limbic system becomes flooded with stress signals. When the limbic system is stressed, the neocortex doesn’t work properly. So that’s why your child struggles to be reasonable, to listen, or to control their impulses. They do stupid things which normally they wouldn’t do and which, when they are not stressed, they know perfectly well not to do. They also can’t articulate adequately. When we tell them to ‘use their words’ rather than lash out, this is often too difficult for them to do in the heat of the moment. Language is controlled by the neocortex which, as the limbic system is stressed, isn’t functioning adequately. They literally can’t put their feelings into words or figure out a better way to act. To relate this to ourselves, can you think of a time when you were so angry that you literally couldn’t speak. The words just couldn’t come out or you just wanted to shout uncontrollably?! Or was there a time when someone was shouting at you or putting you down and you couldn’t think of a thing to say, only to come up with a brilliant retort 2 minutes later as you were walking away? (so frustrating!). Again, this is because our limbic system was assessing the external situation and sending stress responders to the other parts of the brain causing the articulate, rational, even witty you to be temporarily suspended. Armed with this knowledge about the brain, the first thing we can do is to have compassion and an understanding of what is going on for our child. They really can’t help it when they hit out at their sister, shout or throw something in anger, have a tantrum or burst into tears. Although this may be difficult, the most important thing we can do is to try to be really calm and lovingly connect with our child. You might do this by slowly moving closer to them, letting them know you see how hard it is, telling them that you will stay with them while it’s hard and then simply listening as their feelings pour out. 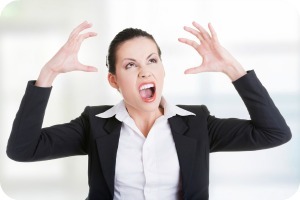 For more information on how to respond, read Dealing with Tantrums. Our limbic systems ‘talk’ to each other – to the point that we can sometimes sense what another person is thinking or about to do next. Our limbic system helps another person’s limbic system to calm down. Our limbic system can help our child’s limbic system to calm down. In fact, that is what it needs to do most. Hence isolation tactics such as Time Out or “Go To Your Room To Calm Down” aren’t particularly effective and can actually increase the child’s distress. It may take a while for the child to calm down. They may continue to cry, thrash around, feel scared or struggle away from you for some time. All of these things are important as the child is releasing all of their stressful feelings and once they are done, they can regain their sense of equilibrium and their sense that all is well. In fact, they can only adequately release these strong emotions whilst they have that warm and caring connection with you. Think of it as a pressure valve that, when opened, lets out all the horrible feelings they have been carrying for a while. Our calm, loving presence provides the safe space in which to release and then they can return to a state of happy peace and their brain can function well again. This connection is called limbic resonance and is what we all need to come back to being our happy selves. If you’d like to know more, I highly recommend A General Theory of Love, by Thomas Lewis, M.D., Fari Amini, M.D., Richard Lannon, M.D.